Update: One World Trade Center stands above the rest! 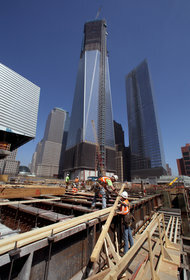 Construction efforts down at the World Trade Center site are scheduled to reach a major milestone sometime this afternoon – roughly one year after the death of September 11th mastermind, Osama bin laden. If the winds are forgiving enough over Lower Manhattan — up where workers can see the whole outline of the island’s tip — a steel column will be hoisted into place Monday afternoon atop the exoskeleton of 1 World Trade Center and New York will have a new tallest building. More important, downtown will have reclaimed its pole star. A tower has again become an inescapable presence at the southern end of Manhattan. From a construction point of view, the completion of the framework, known as the topping out, will be a more significant milestone. That is to occur in a couple of months, when 1 World Trade Center reaches 1,368 feet at its rooftop parapet, identical in height to the first 1 World Trade Center, which was destroyed, with the rest of the complex, in the terrorist attack of Sept. 11, 2001. The ultimate topping out will be the completion next year of an antenna that will bring the structure’s overall height to 1,776 feet. This milestone has taken far too long, but is greatly anticipated nonetheless. Next post Who's Behind the Twitter Assault on Conservatives?